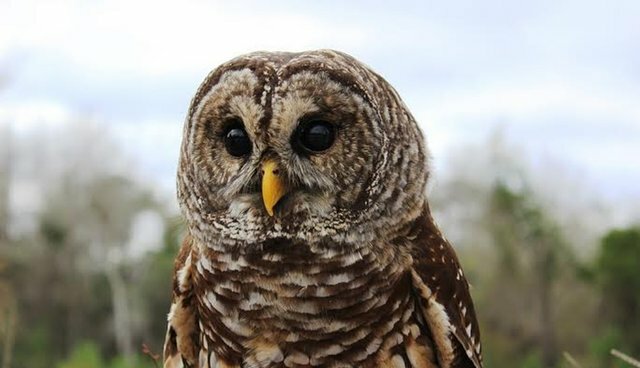 Last October, a barred owl was brought in to Possumwood Acres Wildlife Sanctuary in Hubert, NC. Initial evaluation was most likely a car strike and suffering from a severe concussion. There was bleeding coming out of the nares (nostrils) and very obvious eye trauma, making for a dim prognosis. The staff was very concerned with internal bleeding, possible brain damage, and blindness. Working in wildlife rehabilitation in NC is not always an easy job. Rehabbers work with zero funding from the state/federal government. There is little concern for our beloved wildlife. Veterinarians do not deal with wildlife and rehabbers are not allowed to practice veterinarian medicine - so you can see the problem! Rehabbers here are like EMTs, we give emergency treatment and hope for the best. Except there is no doctor waiting at the end of the ride. The barred owl made it through the night so we set him up in a crate and continued to treat the symptoms. We thought the owl was male due to a weight of 556 grams (slightly under weight). After a week, staff members allowed themselves to be more positive about the prognosis as he made it through the most trying week. He was being tweezer fed mice, putting on weight, responding to care all around. Then, it was realized there was a vision problem. Heartbreaks all over again! We cannot release owls with severe bad eye sight. The new problem made us question many avenues. Do we keep him? But we already have two non-releasable barred owls. We can try to find him a home at a zoo or sanctuary. 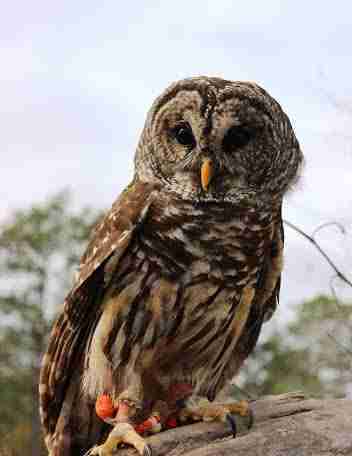 But we have been down this road before, Barred owls are a common species and everyone already has them. Also, we need to know the exact extent of the vision impairment - completely blind creates a whole new set of issues. You simply cannot place him in a mew (raptor cage) and expect him to find food he cannot see. Over the next couple weeks it was also realized he was most likely a she! The weight had gone up to over 800 grams. Female raptors are always the larger of the species and 800g is a safe bet on female. We also started manning her (process of acclimation of bird to human handling on a glove). This was when the discovery was made! 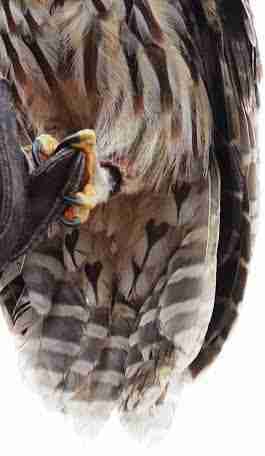 Heart designs throughout her tail feathers. The Latin word for heart, cor, was used to create her name: Cora. The next step is to legally be able to keep her and use her for education programs. She would be the perfect owl to use to bring to schools to show children. But before we would be allowed to do this we first need to build her a special cage that gives her some room to move about, but is still small enough to find her food each night. She would not be able to manage well in the large outdoor cage we have for our other two display owls. Once that special size cage is built, we have to send in an application form to the Fish and Wildlife Service (FWS) and request Cora become our animal ambassador.